SPECIFIC FALL COACHES SUMMER LETTERS ARE ATTACHED TO THE LINK - LOCATED ABOVE LEFT CORNER OF THE Athletic Department PAGE "COACHES SUMMER INFORMATION"
New York State regulations require all athletes to have a valid physical exam on file with our school nurse, dated within one year of the start of practice. We urge this examination be done by the family physician who knows your child best and can give a complete examination including tests and immunizations. NEW: All physical exam papers from your own doctor must be completed on the New York State APPROVED FORM (ATTACHED). Please turn in to the building nurse at least 2 weeks prior to the start of practice to ensure that you may participate on the first day. For students who are unable to have a physical exam by a private physician, the school will be available for sports physicals this spring on June 6th and 7th during the school day. Please contact Heather Cavalluzzi, the high school nurse, at 315-445?8329 or Stephanie Tortorelli, middle school nurse at 315-445-8258 to make an appointment for your student. This is the only date the school will be available for fall sports. Additional physicals will be scheduled prior to the start of winter and spring sports seasons. Fall practices generally take place just after school and conclude by 5:00pm. Note that most teams have Saturday games and practices. During the winter months and early spring when practices are indoors, teams practice on a rotating schedule that could last until 9:30pm. Transportation home after practice each day, and to practices held in the evening and on weekends must be provided by the family. High school level interscholastic athletics require student-athletes to practice and play over school breaks. 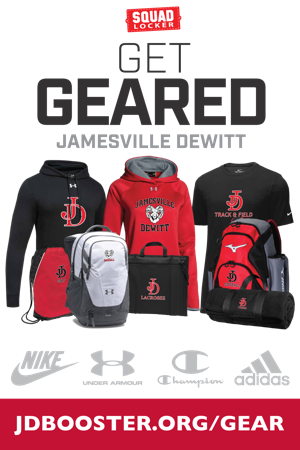 If you have any questions please feel free to call the athletic office, or check our web site at www.jamesvilledewitt.org/athletics. Current game schedules and directions to opponents are also available at this site. New York State regulations require all athletes to have a valid physical exam on file with our school nurse, dated within one year of the start of practice. We urge this examination be done by the family physician who knows your child best and can give a complete examination including tests and immunizations. NEW All physical exam papers from your own doctor must be completed on the New York State APPROVED FORM (ATTACHED). Please turn in to the building nurse at least 2 weeks prior to the start of practice to ensure that you may participate on the first day. For students who are unable to have a physical exam by a private physician, the school practitioner will be available for sports physicals this spring on June 6th during the school day. Please contact Stephanie Tortorelli, the middle school nurse, at 445?8258 to make an appointment for your student. This is the only date the school will be available for fall sports. Additional physicals will be scheduled prior to the start of winter and spring sports seasons. Practices generally take place just after school and conclude by 5:30pm. Note that some teams have Saturday games and practices. Transportation home after practice each day, and to practices held in the evening and on weekends must be provided by the family.